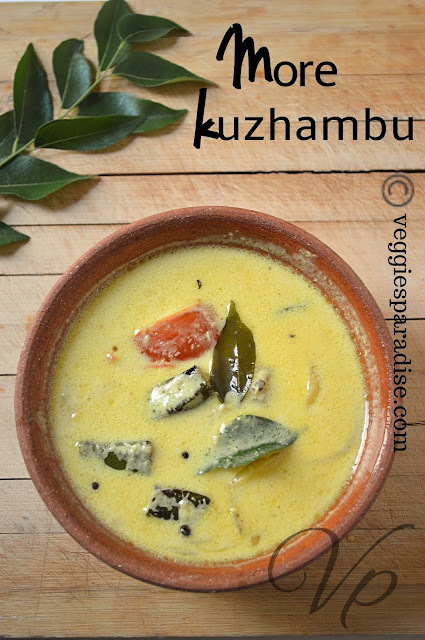 More Kuzhambu - This is also one of the most popular Kuzhambu prepared in South India using Buttermilk . The most commonly used vegetable is pumpkin or Lady's finger (vendakkai), but also can be prepared with drumstick and brinjal.The main ingredient being More (Buttermilk) should be slightly sour and this pairs well with any spiced curries like potato fry or yam fry. Step 1 : In a vessel add the buttermilk along with turmeric powder and few curry leaves. Stir it well and keep it aside. Step 2 - In a bowl , add all the ingredients and soak in sufficient water for about 30 mins. Step 3 - Slice the onions , tomatoes and lady's finger. Step 4 - Now in a blender , add 1/2 cup of grated coconut along with the soaked ingredients and grind it to a smooth paste. Step 5 - Mix the grinded paste in the buttermilk along with salt . Mix it well . Keep the vessel in a low flame and keep stirring. Step 6 - Meanwhile heat oil in a pan, and fry the okra well until they turn slight brown in colour. Keep it aside. Step 7 - In the same pan add a tsp. of oil add mustard seed, when it stops spluttering add urad dal, curry leaves , red chillies and a pinch of asafoetida. saute for a minute. Step 8 - Add the sliced onion and fry until they turn translucent, add the tomatoes and saute it for few minutes. Tomatoes need not be cooked until they turn mushy. Step 9 - Finally add the fried okra's and the fried items to the buttermilk and mix it well. When you notice the sides of the kuzhambu coming to a boiling stage. Remove from heat. 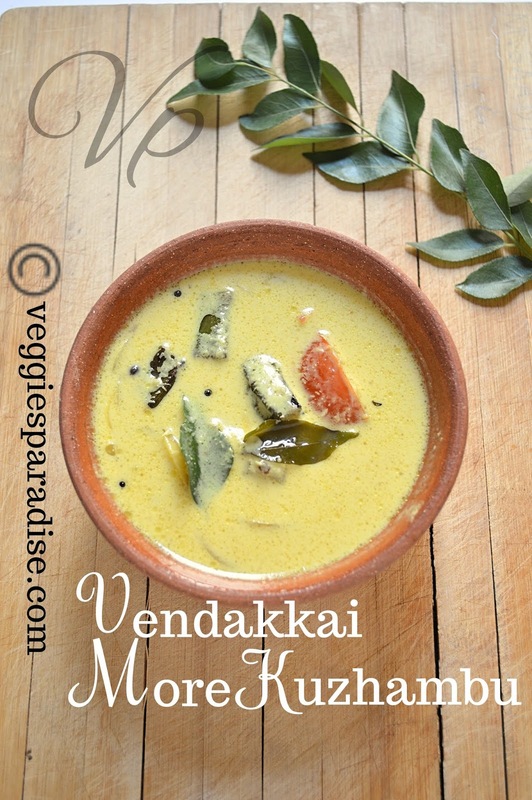 In a vessel add the buttermilk along with turmeric powder and few curry leaves. Stir it well and keep it aside. In a bowl , add all the ingredients and soak in sufficient water for about 30 mins. Now in a blender , add 1/2 cup of grated coconut along with the soaked ingredients and grind it to a smooth paste. Mix the grinded paste in the buttermilk along with salt . Mix it well . Keep the vessel in a low flame and bring it to boil. Meanwhile heat oil in a pan, and fry the okra well until they turn slight brown in colour. Keep it aside. In the same pan add a tsp. 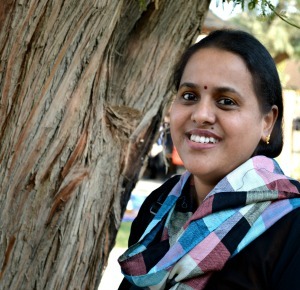 of oil add mustard seed, when it stops spluttering add urad dal, curry leaves and a pinch of asafoetida. saute for a minute.Add the sliced onion and fry until they turn translucent, add the tomatoes and saute it for few minutes. tomatoes need not be cooked until they turn mushy. Finally add the fried okra's and the fried items to the buttermilk and mix it well. When you notice the sides of the kuzhambu coming to a boiling stage. Remove from heat. 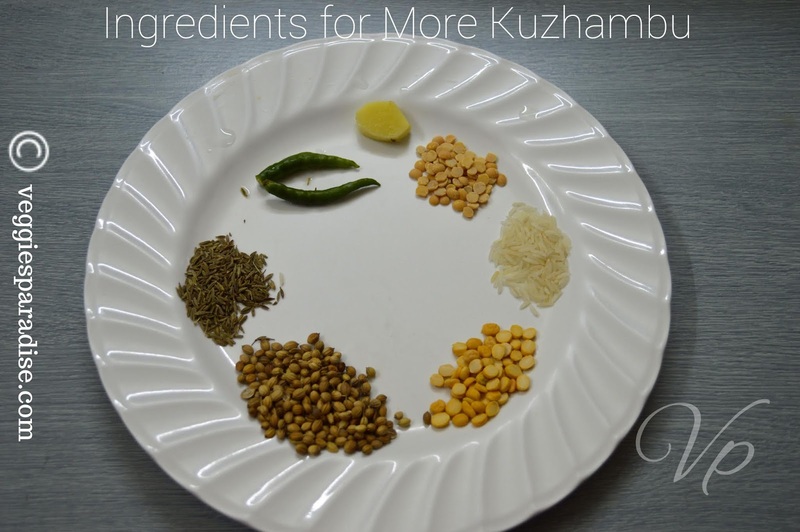 The kuzhambu tastes well when you prepare it with sour buttermilk. Don't cook in high flame as it will curdle. Good one. Thanks for sharing! my fav one. i make it in a differnt way. 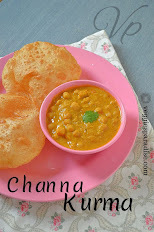 I know adding pumpkin and okra in morkulambhu. All other veggies r absolutely new to me will try using it next time.